This week's edition shall see us heading to Telford on Friday night before heading back up north to Liverpool. The weekend ends with trip across to Leeds. It's time once again to get Ready For The Weekend! 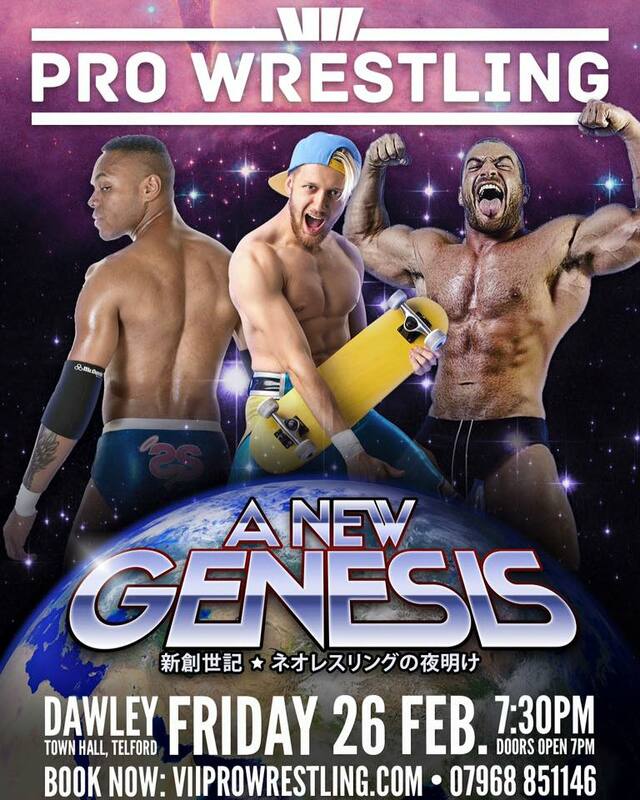 Kicking off on Friday night and VII Pro Wrestling are at the Dawley Town Hall in Telford. The show will mark VII Pro Wrestling's first event since changing their name from Shropshire Wrestling Alliance. The show features numerous debuts, two of which are 'The Fashionista' Jinny and New Zealand's Dahlia Black. Both women have been making waves in British Wrestling over the last few months and will hope to do that same in Telford. VII Pro want to reignite their female division and these two competitors will do a great job of fanning the flames. At the last event in Telford, Chris Brookes became the British Lions Champion in a six-way ladder match. However, it was in fact Mark Andrews who retrieved the championship from above the ring. With the referees distracted, Brookes took advantage by delivering a low-blow to Mark Andrews and taking the championship just in time for the referees to declare him the winner. Understandably, Andrews is far from happy and neither were the fans. So this Friday, Brookes and Andrews are going to meet one on one with the British Lions Championship on the line. Let's see if Brookes can keep the gold when the focus is solely on him and his opponent. 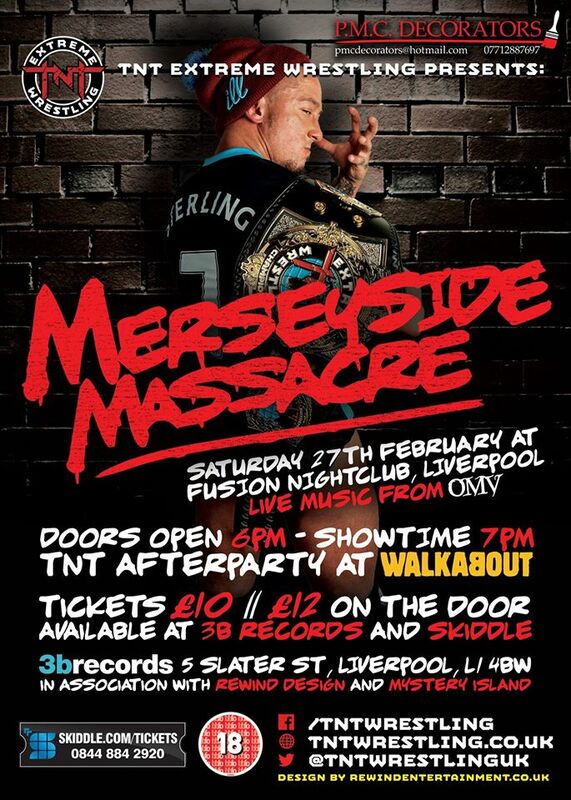 The main event on February 26th sees the current VII Pro Champion, 'All Day Star' Ryan Smile in action. His opponent? One of the hottest independent prospects in the world right now. Beyond Wrestling's 'The Dirty Daddy' Chris Dickinson. In his last defense, Smile was able to defeat Dan Moloney and now wants the best competition he can have. VII Pro have certainly delivered on that front as Dickinson has been making a name for himself wherever he has gone. His sights are now set on VII Pro Wrestling and challenging the top man in the company. ‘Number One’ Damian Dunne vs ??? 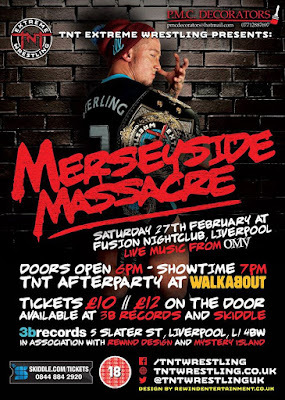 Moving on to Saturday and we head up to Liverpool for TNT Extreme Wrestling's Merseyside Massacre at the Fusion Nightclub. At TNT's last event, Bubblegum became the very first TNT "World" Heavyweight Champion by defeating Rampage Brown after some help from Ashton Smith, Sam Bailey and a steel chair. Brown is an aggressive competitor at the best of time but Bubblegum has now pissed him off and he has demanded a shot at the championship and revenge. TNT have granted Brown his request and also added the stipulation that steel chairs will be legal. Bubblegum might be lucky to leave with his life on Saturday never mind the TNT World Heavyweight Championship if Brown has a say in it. Speaking of Ashton Smith & Sam Bailey, a man who was enraged with their actions at the last TNT show was Ruffneck. 'Mr TNT' has been almost the conscious of TNT, dealing out justice to those who disrespect not only TNT but it's fans. Ruffneck has now joined with The Babyfaced Pitbull to challenge the new Manc Union to a match. While the Manc Union may be quick to dismiss Pitbull & Ruffneck, failing to see the danger may be their undoing. Every show has an element of unknown about it but we can guarantee that we will have a new champion this Saturday. A few weeks ago, TNT Extreme Wrestling announced the TNT Extreme Division Championship. They promised that the challengers would be known for their extreme, no limit style. They haven't let us down either with Robbie X, Chris Ridgeway, Flash Morgan Webster and Liam Lazarus all competing in a fatal four-way match. All four of these men are on the rise, constantly getting better with each passing week. Nobody has a clear winner and anyone could be leaving as the inaugural TNT Extreme Division Champion. 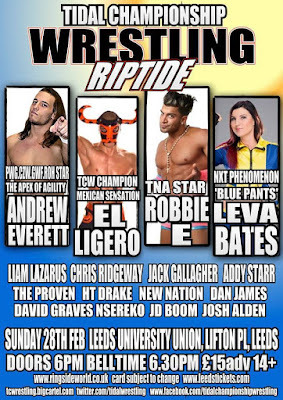 Finally ending another packed weekend and Tidal Wrestling are back at the Leeds University Union. The show shall see the debut of former PWG World Tag Team Champion Andrew Everett who shall go one on one with the best in Tidal Wrestling right now, 'The Mexican Sensation' El Ligero. This is sure to be a very fast, high-flying affair with both men known for their speed and agility. 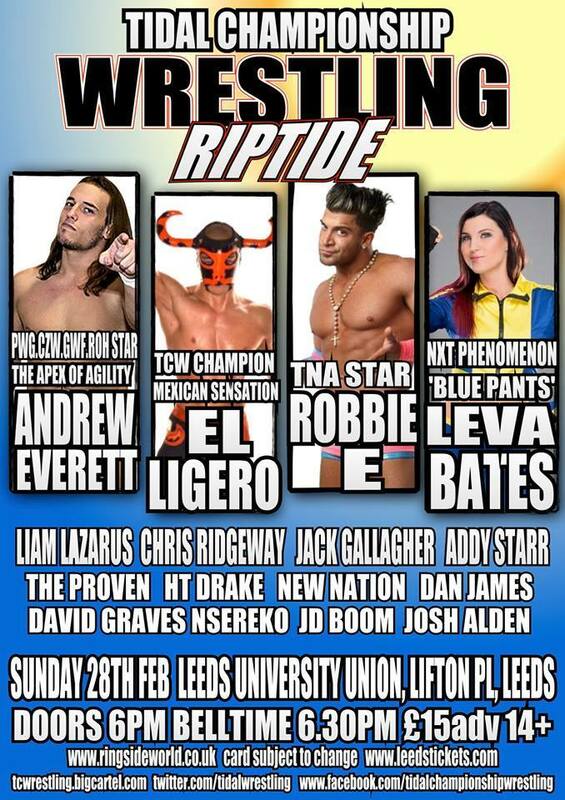 Ligero has been on a good run during his second reign as champ and shall look to continue that this Sunday. From one champion to another as Dan James shall be in action on Sunday defending the TCW Open Championship against one of the best pure wrestlers in Europe, Jack Gallagher. These two men were previously scheduled to face each other a number of months ago but car issues stopped James from competing. So now he's going to do what he never got the chance to do before; face a world-class athlete but this time his championship is on the line. This Sunday, HT Drake was due to face Robbie E but due to some unforeseen circumstances that match won't happen. However, HT Drake shall still be competing. His new opponent will be 'The Juice' CJ Banks, who shall be making his Tidal Wrestling debut. HT Drake has been having some killer matches recently in TCW and could soon be in line for a championship opportunity. He will need to get round this new roadblock in the shape of Banks for that to happen though. To continue on his road to being the best in TCW, he's going to have to defeat one of the best in the UK and Banks will not go easy on him.